Hello all. I have traveled to Thailand 6 times in the past two and a half years or so. I have *never* had a problem with the taxis. At the airport, the cab situation is very similar to flying into DC National. There is a taxi queue line, where only approved taxi's are allowed to pick up. There is an explanation of the fares, etc. I believe there is a small airport surcharge (same as National) and the cab driver will either ask you for the toll money in advance or will add it to the fare at the end (which is explained at the taxi queue booth). As for flights, I usually search on orbitz, locate a cheap flight, but then book it directly on that airline's website to avoid the orbitz fees :) I have found decent flights on ANA and United. United will book your flight on other star alliance airlines (ANA, Thai Air, etc). As of last May, Thai Air and Singapore Air have direct non-stop flights flying out of JFK! It greatly reduces travel time!! My last trip in November I flew Thai Air thru JFK. The flight is only 16.5 hours non stop. Thai Air has brokered a deal with the Russian government to offer flights in and out of Moscow. Because of this, they are now allowed to fly through Russian air space. The JFK - BKK flight goes directly north, just to the right of the north pole, and then down over Russia, Mongolia, China, and into Thailand. I highly recommend this flight. You can had a United agent check prices and book for you. Don't worry about travelers checks and also avoid converting your American money to Thai. There is a charge for cashing travelers checks as well as converting your money. Also, the Conversion places don't give you good exchange rate. Instead, use your ATM machine to withdraw Thai money. The banks work out the best exchange rate among themselves and you will get the best value that way. There is also a ton of ATM machines around, so its very convenient! If you decide to take a Tuk Tuk, always negotiate the fare first. Also make it clear that you are only interested in going to your destination... No "shopping" and no massage. The tuk tuk population has definitely dwindled due to the rising gas prices and the remaining few definitely seem desperate to make a living. All of the regular taxis run on natural gas, not gasoline, and are not as effected by this. 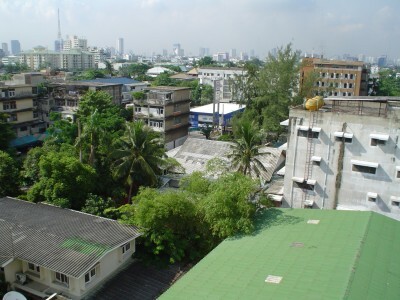 Bangkok Hotels - I would definitely stay somewhere close to lower Sukhumvit, Asoke, Ploenchit, or Wireless road. These are centrally located, pretty close to the BTS, and have a ton of shopping/ entertainment/ dining available. The BTS - The BTS is the Bangkok version of The Metro. It is both highly efficient and highly airconditioned :) If you are going to be spending any amount of time in Bangkok, its probably best just to buy the stored value card and avoid the "Day Passes". I believe the cards only cost 30 baht (75 cents USD) and are very convenient. There is also a new underground subway called the MRT. This requires a separate card, but its easiest just to buy the trip token at the vending machine. Its extremely hot and extremely humid. Make sure that you are drinking plenty of water. Bottled of water can be purchased very cheaply (under 50 cents USD, sometimes under 25 cents!) at 7-11. 7-11 - They are EVERYWHERE! I read somewhere that there are over 1000 7-11's in Bangkok alone. You can find one on almost every block. Sometimes they are even directly across the street from each other! Mobile phone - If your current cell phone uses a SIM chip, make sure you call your provider. Tell them that you are traveling overseas and you will be using a local SIM chip. They will give you a code to unlock your phone. When you arrive in Thailand, go to 7-11 or Jay-Mart and ask for a 1-2-Call SIM and also prepaid minutes. Most of the time they will activate it for you and add add the minutes for you. The phone minute rates are very reasonable... even for calling back to the US!